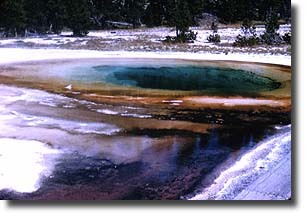 Truly deserving its name, Beauty Pool is noted for its rich, blue water framed by rainbow-colored bacteria. Its plumbing system is closely related to the neighboring Chromatic Spring. Click "Next Stop" below for more details.